Apple may be on a quest to rid the world of buttons, but it hasn’t quite managed to pull it off just yet. Our iPhones have touch-screens that can take the strain for the most part, but we still have hardware Home and power buttons. In many ways it’s the way it needs to be, but that’s no consolation when either your hardware buttons stop working, or you have a specific accessibility need that means pressing those hardware buttons isn’t practical. Once again, jailbreaking comes to the rescue with one tweak taking the problem and offering a solution that looks like it could well be right on the money. Well, it’s free, but you get what we mean! Once installed via Cydia for that super awesome price of not-a-penny, SPTouch will show a new button on the screen that can be moved around somewhat similar to how Facebook’s Chat Heads behave. The icon can be flung around the screen so that it is as prominent as needed, or even placed right on the edge of the screen so that it doesn’t get in the way. It’s what that icon does when pressed that makes the tweak so useful though. See, tapping on that new icon will emulate a press of the Home button. A double-tap will launch the app switcher, and a long press will lock the device, effectively replacing all hardware buttons except the volume controls, and since they’re available via Control Center anyway, that’s no great issue. The icon itself can be customized just as you like it too. The size, color, and transparency are all customizable via the Settings app, so you really can get the look you want depending on whether you want SPTouch to disappear or not. Options, options, options. We like options! If you’ve a need for such a thing, SPTouch is a bargain considering it’s free, and it’s certainly cheaper than getting a new Home or power button fitted to that old iPhone. It can be made as unobtrusive as you like too, which is a bit win in our books. But keep one thing in mind: although iOS 7 offers Assistive Touch via Accessibility options to offer the same thing, but SPTouch is a lot less obtrusive and more ‘to the point’. 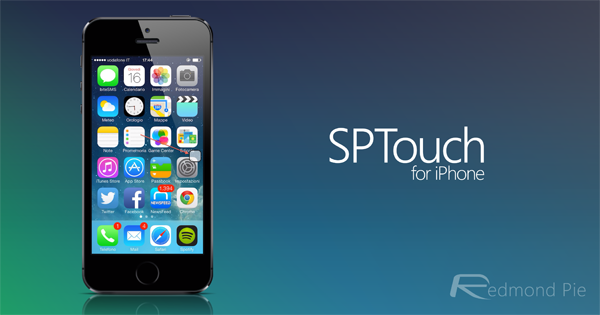 The SPTouch tweak can be downloaded from the BigBoss repo in Cydia.